It’s that time of year again. The sun is out, the bags are packed, now it’s time to throw that pin on a map and choose a destination. In order to fully take advantage of the sun, nothing would beat a luxurious vacation aboard a posh superyacht whether you are in St. Tropez, Ibiza or the Hamptons. Envision an impressive gross tonnage of 395gt, gliding across the water, with a sleek and purposeful profile offering six-star accommodation, an imposing main deck with a beautifully appointed saloon and formal dining area. These are just some of the features aboard the Princess Yacht 40M that marries heritage and tradition with cutting edge technology and elegant luxury. An impressive variety of layout options provide owners with complete authority, in order to create the yacht of their dreams, within the elegant parameters of the 40M’s hull and superstructure. Cinema’s, guest cabins and a gym are just some of the items on the menu that can be chosen to fulfill the luxurious quality of the vessel which takes nearly a year to complete in their Plymouth, England based factory. Forward of the main deck is the owner’s suite, occupying the full beam of the hull as the side decks are raised at this point. The suit is accessed through a versatile anteroom, which can be specified as an office, private TV room, and reading room or to suit personal requirements of the owner. In addition, the walk-in wardrobes are a necessity for glamorous nights in tony seaside resorts. Soak up the rays on the palatial upper sun deck with an extensive bar, plush seating and huge Jacuzzi/pool, which serves as the hub for outdoor summer entertaining. A great part of summer is the food you have been longing for all winter and patiently waiting as spring sprung by. A fresh seasonal fruit platter is perfect to tie you over until you can dive into some fresh seafood, with salads, and perhaps a glass of wine or two. The enormous professional galley was specifically designed by a professional chef and is equipped with two catering-size fridge freezers, a hot and cold chef’s pass and a huge pantry for all your on board culinary needs. 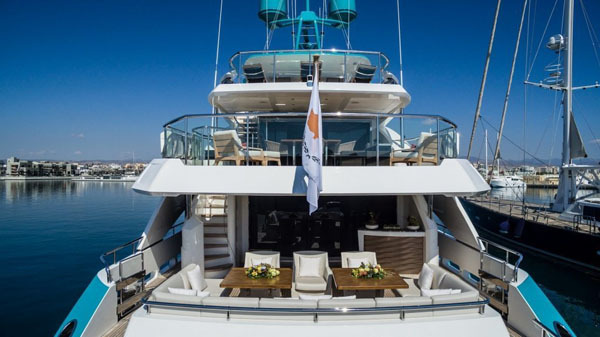 To ensure swift and easy serving, there is a dumb-waiter, which runs from the main deck to both the upper deck and sun deck above, perfect convenience, so you don’t have to leave your oh so comfortable lounge chair. For the more mechanically aware, the wheelhouse is equally impressive with a vast ‘glass bridge’ incorporating the control and monitoring system in a stunning console and the captain’s cabin is also situated here adjourning the helm. She is expected to propel to speeds of up to 22 knots, originating from a pair of MTU 12V diesels. 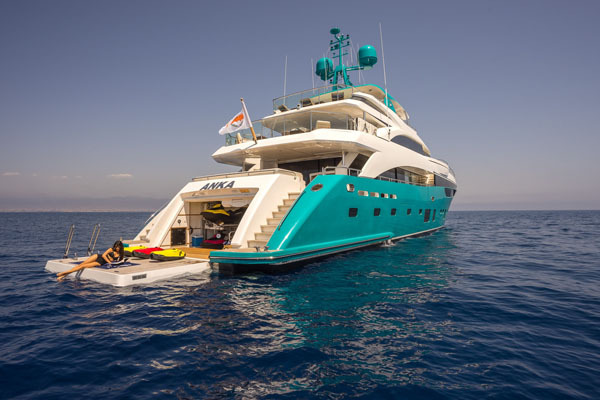 Be the envy in the port with a customized 40M Princess superyacht which is armed with the latest and most advanced technologies swathed in exceptional luxury.